Most people have seen the ad for the latest X-Box 360 game on TV in a theatre lately. It features a game play with no game sounds just â€Mad Worldâ€ by Gary Jules. The ad would have been so much better if they had only chosen to use the Smashing Pumpkins’ Bullets with Butterfly Wings. I went to a small group meeting with the BlackBoard team later this afternoon. I knew I wasn’t going to get them to rescind their patent or drop their suite, but I think it went well. Matthew, Peter & Jan from Bb talked with Sakai community members (I don’t yet include myself in that community and I don’t really speak for Brock, but I know they don’t) and talked about ways they can reconcile. I shared my opinion that Bb burnt a lot of goodwill when the obtained this patent and most importantly, when the sued D2L over it. Bb and the Sakai community can’t resolve their difference and they need to rescind their patent or wait for a legal judgement before anything happens. Bb has taken a position that will probably ensure they will never have a positive relationship with the Software Freedom Law Center. What I encouraged Bb’s team to do was contribute to places where the two entities both have seats, like the IMS standards groups, or with publishers, and make their contribution there . My suggestion is that if they can make their archive files an open standard and their support for IMS course content packages a bigger part of their software they can compete on the merits of their product and not the fact that they hold a lot of content prisoner in it. If content was more portible between systems Bb/WebCT’s .zip archive files could become like .doc files are to things like OpenOffice and WordPerfect. I also asked about Bb/WebCTs integration into open source tools like phpWiki and what their motivation was to get a sense of their feelings towards open source. The answer was to the affect of they’re leveraging a technology that has little cost to them and they want to integrate with more tools like that, which is what I wanted to hear. Bb v. SFLC, Sakai, Moglen, rational thinkers, et all. Today I attended an excellent panel on the current BlackBoard patent (and indirectly their legal action against Desire 2 Learn) that featured Eben Moglen, General Counsel for the Free Software Foundation, and the Chairman of Software Freedom Law Center and Matthew Small, BlackBoard’s senior legal council. Both parties took questions and talked about Bb’s patent. This followed the morning keynote by Moglen that was excellent, as he is a great speaker and a great advocate. I recommend the podcast when it comes out. It also follows a motion filled by the Software Freedom Law Center to invalidate Bb’s patent. Small attempted to clarify that they only hold a patent on multiple educational roles being performed by one person and that they are interested in supporting open source and that he believes Sakai is trying to fight a war that BlackBoard dosen’t think they’re in. Ultimately, Bb (which owns WebCT) has no position on software patents other than they are the law as it exists and Bb will avail themselves of whatever legal system they have to work with. Moglen flatly denied that the patent was anything close to valid and said that any concern about it was moot as it would soon be gone. He also pointed out that what Small claimed was the focus of their patent, and the part that has no prior art, was “roles may be mixed; for example when an instructor of one course, is also a student in another course” – that line is actually found in brackets inside of The user roles comprise a student role associated with a student user, an instructor role associated with an instructor user, and an administrator role associated with an administrator user (roles may be mixed; for example when an instructor of one course, is also a student in another course). — Hardly the focus of the patent. The interesting observation I’ve made about Atlanta is that you really feel like you’re doing the wrong thing walking anywhere at any hour of the day.Â The car is king in the south, and the four lane drive-through bank you can see on the train from the air port signifies this.Â That said, I do appreciate the level of respect for the car that ensures that 1 in every 100 cars here has been modified to express the owner’s enthusiasm for the vehicle or for spinning chrome. There isn’t a lot to do that is immediately evident.Â I’m going to try to swing by CNN headquarters and Olympic Park,Â but the conference program and the safety and the Atlanta streets make it hard to go very far at night. The Leafs were here from TorontoÂ on Monday night and got a beating, I don’t want to continue that trend. As I fly to Atlanta I’m starting another flurry of blog postings. The first one is my piling system. It’s like any old filing system only the key to it is large Zip-Lock Quick Zip bags. 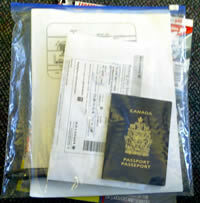 This allows you to collect items of all sizes, including 8 1/2 x 11 sheets of paper (which other zip-lock bags do not). It seals everything in, you know what is in the bag at a glance and there’s no need for labels. It also has less of a requirement for being filed vertically, hence the name piling system. I appreciate this system most when I travel because it’s easy to take things in and out of but it doesn’t lose things when you’re not looking like a filer folder does. The best pare is that you can consult things like your gate number just by looking through the plastic. There is the argument that it removes all confidentiality of the contents, but my observations of your women carrying around these big mesh bags at Brock makes me think that privacy is no longer cool. So there you are, the piling system. Storing your important files in a zip lock bag for easy reference: it’s what out-tripper’s in the back of canoes have known for years. You are currently browsing the iMatt :: The Blog of Matt Clare weblog archives for December, 2006 .